Ellipsis Consulting, a Silicon Valley-based consulting company offering marketing & executive coaching services to businesses of all sizes. 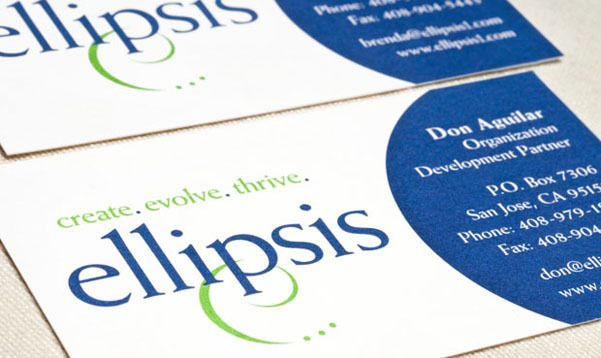 Ellipsis was a new entity that looked to e design for help with a complete branding package. The consulting company was made up of two divisions; marketing and executive coaching. Because the divisions served clients ranging from start-ups to Fortune 500, the brand needed to convey a strong sense of professionalism and creativity. The logo crafted by e design was a riff on an ellipsis (you know, the dot dot dot…) produced in a color palette that appealed to the company’s wide spectrum of clients.